My other half and I have a double act we like to perform when visiting new and unfamiliar places. This usually involves a moonless night, unlit back streets in the wrong end of town, google maps and intermittent/no phone reception. What ensues is a lively duologue, wild gesticulation and a wary but amused audience of passers-by. This was the prologue to our evening at Ristorante Matusel so it was with some relief that we eventually found the narrow, unmarked doorway to a restaurant we had chosen, somewhat ironically, because it was fairly close to our apartment. Irritated but still together, we entered the restaurant for the second stage of the relationship tester…the empty restaurant. Forgetting that no self-respecting Italian would enter a food establishment before 9pm, the staff met our sudden appearance with gasps and shocked faces. We were led to the table of our choice, (so many to choose from…all of them in fact) and our bottoms hovered over the seats: to stay or not to stay, that is the question. ‘Let’s just have a drink,’ and, ‘I bet it’ll be full by 9:30’, broke the silence and the decision was final, we were staying. The next hurdle was the expansive menu written on a chalkboard, not only in Italian but with the addition of flamboyant handwriting. It does add a further barrier and all we recognised were the words ‘Carne’ and ‘Pesce’. Thankfully the waiter was very helpful and translated the entire menu word-for-word, very quickly. Inevitably it was still culinary lottery as there are only so many times you can say, ‘umm what did you say that one was again…the ttttonno..con…ummm…razzo…ummm, how do you say…. ?’ His patience had its limits so we ordered blindly and these were the results! Our starters arrived and were delicious. 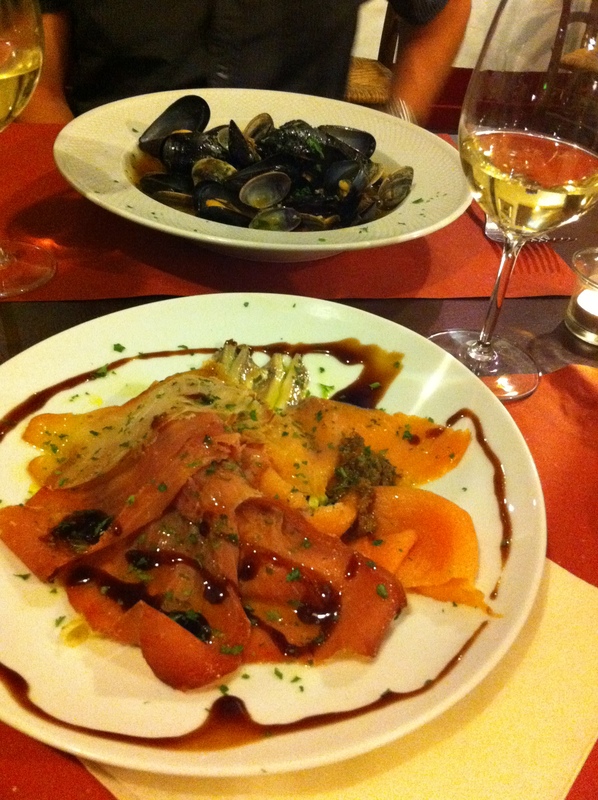 I had a velvety, fresh carpaccio of tuna, swordfish and fresh anchovy, sat atop a radiccio salad with a balsamic dressing and my other half had a clam and mussel saute, more of a soup really but full of fresh and perky mediterranean flavours and heavy on rich and fruity olive oil. But the main course was a revelation! 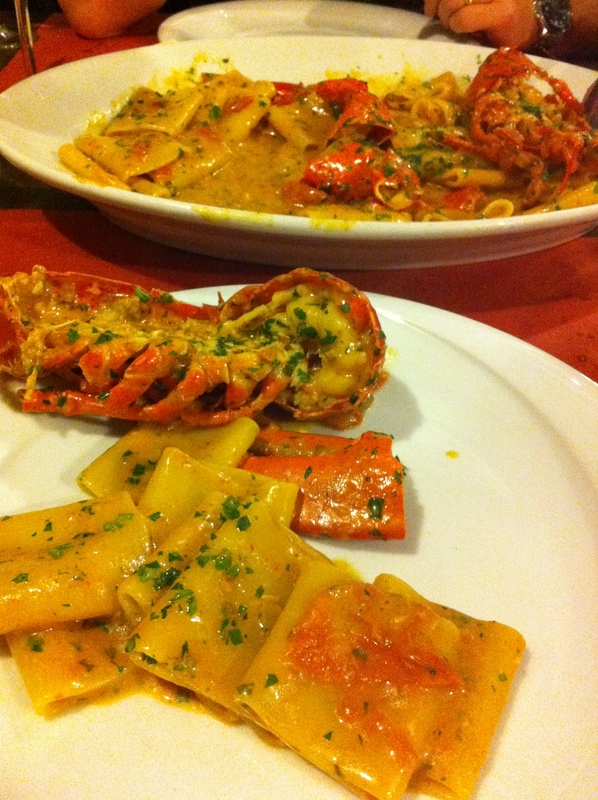 The most buttery, winey, richly flavoured lobster Pepponi pasta topped by the pieces of a whole lobster was our shared ‘secondi’. Thank goodness we both wanted the same dish (served only for two or more) as I would happily pull a stranger from the streets to share this with me. We left Matusel and stumbled happily back towards the apartment, uncaring as to whether we’d ever find our way back. We could always go back and sleep in the restaurant doorway and wait for it to reopen for lunch tomorrow!